im always worried about the apocalypse. im glade someone has thought of housing solutions for the apocalypse. The name of the competition — “What If New York City…” — evokes the doom-and-destruction theme that seems to be running through popular culture. The premise of the competition, announced last September, is far more practical. Designers were asked to consider a “fictional but realistic New York City neighborhood” — Prospect Shore — were devastated by a hurricane, leaving 38,000 families without housing. Could effective designs be used to provide safe, comfortable living space for displaced people in a hurry? Could such shelter be cheap, environmentally responsible and reusable in other settings, including future emergencies? Architects, industrial designers, engineers, inventors and students from 30 countries submitted 117 submissions, and in a 20-page report [pdf] released today, the jury competition announced 10 winners and 10 honorable mentions in the competition. Mayor Michael R. Bloomberg and Joseph F. Bruno, commissioner of emergency management, announced the winners — who will each receive $10,000 — at a news conference in Brooklyn. David Hill of Raleigh, N.C.: Treading Water. Housing units would be placed atop floating barges, allowing for debris removal and gradual restoration of the ravaged coastline. The units would be made of fiberglass panels, with photovoltaic cells to provide energy. Hydroturbine grids would provide a permanent power source, while the barges would eventually acceleration the natural restoration of the estuary. James Vira of Manhattan: Rapid Deployable Inflatable Containers. The size of shipping containers, these inflatable structures could be easily moved by flatbed trucks, hoisted by cranes and stacked on top of each other to create apartment-block-like complexes. Multiple containers would make up an “agglomerated living unit” that would allow horizontal and vertical movement from one container to another. 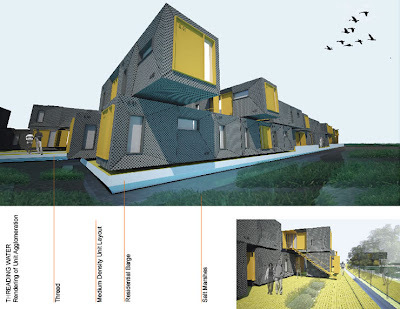 Carsten Laursen of Copenhagen: Assuming the “collapse of urban structure” and the leveling of entire areas, easy-to-assemble hexagonal housing units could be the basis of a new urban grid, transcending the traditional street grid of long thin blocks. “The convergence of multiple uses creates a vibrant and dynamic urban space that underlines the importance of bringing people together in a crucial time in their lives,” Mr. Laursen wrote. The jury evaluating the submissions comprised seven members: David J. Burney, the city’s commissioner of design and construction, who was the jury’s chairman; Mr. Bruno; Paul Freitag, development studio director and senior project manager at the Jonathan Rose Companies; Mary Miss, an artist; Guy J. P. Nordenson, a structural engineer and Princeton professor; Enrique Norten, architect; Richard Plunz, professor at the Columbia Graduate School of Architecture, Planning, and Preservation; and a facilitator, Lance Jay Brown, an architecture professor at the City College of New York. The competition received financing from the Rockefeller Foundation and help from Architecture for Humanity-New York, a group of design professionals who encourage social responsibility. Inspiring or depressing? Realistic or fanciful? These designs are going to be studied as part of the city’s emergency preparedness plans; if catastrophe strikes, you just might see a Rapid Deployable Inflatable Container floating up the Hudson or East River to the rescue.